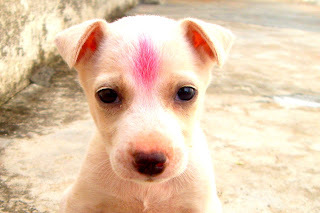 Jugaadu Internet: Two Little Pups - Orphaned and Abandoned at Birth. Can SPCA, Bluecross help? Two Little Pups - Orphaned and Abandoned at Birth. Can SPCA, Bluecross help? We get inured to the suffering of humans trapped in the concrete jungle. It becomes easy to be apathetic to the chaos around you. If you have no feelings for humans, what chance do two orphaned pups have of survival? Very remote, most of us will agree. I have heard of Society of Prevention of Cruelty to Animals and even Bluecross but I often wonder whether they have any chance of succeeding in their mission. Honestly, I don't know. Less than a month ago, my college going son, Karan, picked up 3 abandoned pups from the neighborhood undergrowth and asked if we could look after them, at least till they grew up to be able to survive. I looked at those three pups and refused point blank. No way, my better half joined me in my decision. The poor boy said the mother was dead and the poor pups had no chance but when we dug in our heels he had to give up. He shrugged and put them back on the streets. I don't know what he went through but we were sure we could not look after three abandoned pups. Later that afternoon I was disturbed by the pathetic crying and howling. But I was steadfast in my refusal to take them in. Even as I prided myself on my firmness, my wife capitulated. She said we have to take them in. Her agitation forced me to reconsider. She went out and picked up one pup...because there was only one there. Where were the other two? We looked around and saw no pups. My wife was busy feeding the lone survivor and making him comfortable. On closer inspection I saw the poor guy had not even opened his eyes. I was horrified and suddenly realized that the other two must have died. Later that evening Karan returned from college with a small pup. He said he heard the pathetic howling of this pup as he was stuck in some building material strewn all over the neighborhood. The poor blind pup was stuck and there was no one to help him. Karan struggled to free the pup's head from the debris for a good 15 minutes before he was able to free him. The poor pup was exhausted and fatigued and could barely breathe. Well..., to cut a long story short, the two pups are alive and well as we are taking care of them. I have contacted Sriya Narayanan( She writes a pet column for The Hindu) and she has offered to put them up for adoption. She asked me for photographs and I have sent them to her. I don't know if these guys will find good homes. I am worried but the immediate task at hand is to get them vaccinated. And yes, I think of the third pup and wonder if she was lucky like her brothers. I am sure someone must have taken her in. I can't keep them for long and I hope some help comes along. These boys are tough and will survive, nay thrive in our concrete jungle. I'm glad you could find some solidarity with the puppies, even if your wife forced you to do so. We all can learn good things from each other. The puppies could probably die and suffer a lot. Some ignorant people don't think about the puppies and just let them survive alone, thinking they know what to do. The puppies will sure ow you their life and be thankful forever. The good news is that a 10 yr old girl has asked me for one pup and a fellow meditator has shown interest in taking the other pup for his farm. i need to get them vaccinated before I hand them over. Lucky puppies, If you gather the money to vaccinate them, they will be ready for adoption. Maybe some people can help with that. That photo of the puppy with the cute eyes is really touching, He asks for some affection and care. He has that forlorn look. He eats like a champion, wrestles with his more frisky brother but is not very athletic. The other guy is adventurous and more agile. I got them vaccinated two weeks ago. Chinna has found a home. Bhairav(the guy in the close up) remains with us, for the time being. All he needs is food and affection. I gave them their names. The one that was picked up by Karan is called Bhairav and the pup picked up by wife is Chinna. Chinna, we gave him to my daughter's XII th class Physics teacher. He has vanished from there and the teacher is upset. A friend has shown interest in Bhairav and he should go any day now. Bhairav received his second inoculationa few days back and is becoming more frisky by the day.